I’ve seen so many people raving about these masks lately that I just had to look into them for myself. My skin has been a little bit problematic lately and I’d been neglecting my face masks for a while, even though I know they do wonders for my skin I just couldn’t be bothered, so I thought what better way to get back into them than by investing in some new ones. The Body Shop’s new masks seemed exactly what I needed to revive my skin and after doing a bit of research I found that all of the new masks are formulated without parabens, parafins, silicones or mineral oils, which was a pleasant surprise. I know that The Body Shop’s products aren’t natural products but with these new masks it seems that they are trying to cut out some of the chemicals in their products, which is definitely something I can get behind. All of the masks are 100% vegetarian and three of them are even 100% Vegan (Himalayan Charcoal, British Rose and Amazonian Acai). I decided to pick up the Himalayan Charcoal Purifying Glow Mask and the Amazonian Acai Energising Radiance Mask and give them a go. The Himalayan Charcoal Purifying Glow Mask aims to draw out impurities and refine the appearance of pores, creating healthy and glowing skin. It contains bamboo charcoal, green tea leaves and organic tea tree oil to purify the skin and give it a good cleanse. I love a good charcoal mask and find that my skin reacts really well to them – this is no exception. 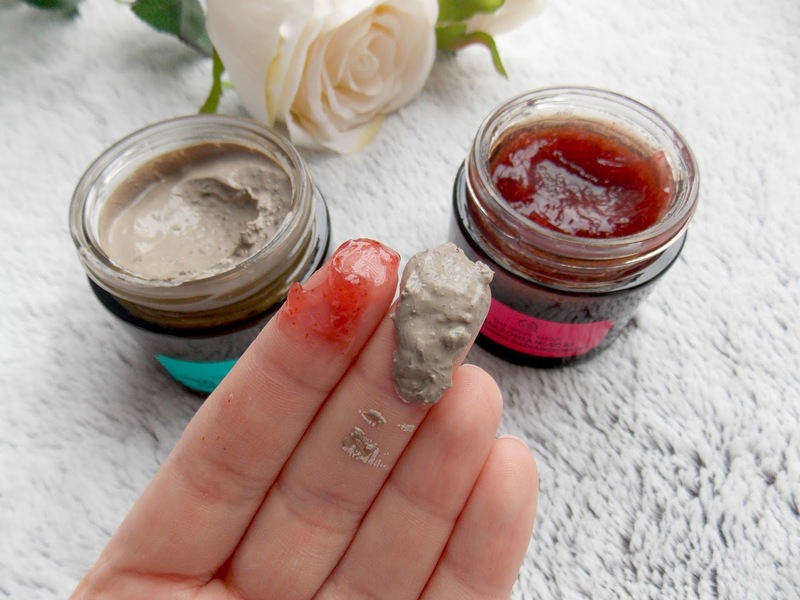 It’s a thick grey mask that you apply to your problem areas (or all over if your face needs it) and then you wait 5 – 10 minutes for it to dry before washing it off. I like to apply this before I jump in the shower and then leave it the full 10 minutes, as I like to give it the longest time to get to work. I then rinse it off in the shower and I’m left with the smoothest, baby soft skin ever. I’m telling you my skin is the softest I’ve ever felt it after using this. The Amazonian Acai Energising Radiance Mask contains acai berry, guarana and babassu oil to exfoliate and invigorate sleepy skin and reduce signs of fatigue and stress. I’ve been pretty stressed lately which always shows on my skin, so I thought this would be the perfect mask to give my skin a little pick me up. This looks a bit like raspberry jam and smells a little like it too – although I assume that it doesn’t taste like it (and I wouldn’t recommend trying it)! This is the same as the charcoal in that you leave it for 5 – 10 minutes and then rinse off, but this one doesn’t dry on your skin. Once this one is rinsed off I can see a difference in the tone of my skin – it looks much more radiant and makes me look much perkier and more awake. This is the perfect mask to use before going out as it really does make your skin look much brighter. 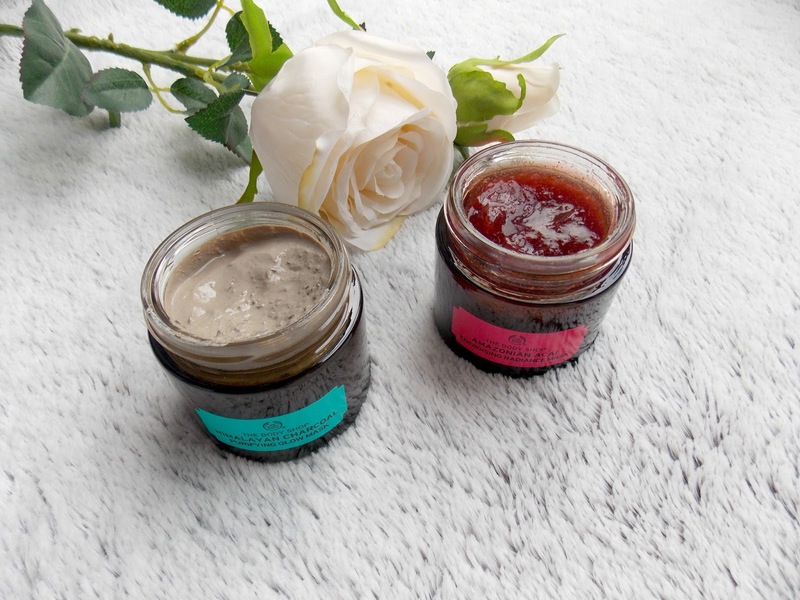 If I’m multi-masking I use the charcoal mask on my t-zone, chin and jaw line and then the acai mask on my cheeks, but sometimes I will use them both all over my face for an intense facial! I’ve only been using these for a few weeks, but I’ve already seen improvements in my skin. My blemishes are less aggressive when they do pop up and I actually don’t have any at the moment – touch wood. My skin is much softer and it looks healthier too, with a nice little glow to it instead of being lacklustre. At £16 each these are definitely not cheap. However, a mask lasts a lot longer than any other skincare product as you don’t use them as often, and you only need a tiny bit to cover your face. If you multi-mask like me then you will use even less, so you’ll get your moneys worth. The only thing that I hate about The Body Shop is that they often have 40% off codes (which is great!) but you can never use them on new products, which just doesn’t make sense to me. Ah well, when they do come under the offer I will be picking up the other masks to try out, as I’m really impressed with these two. Have you tried these masks yet?